One thing is needful. – Luke 10:42. “Now it came to pass, as [Jesus and His disciples] went, that He entered into a certain village; and a certain woman named Martha received Him into her house. 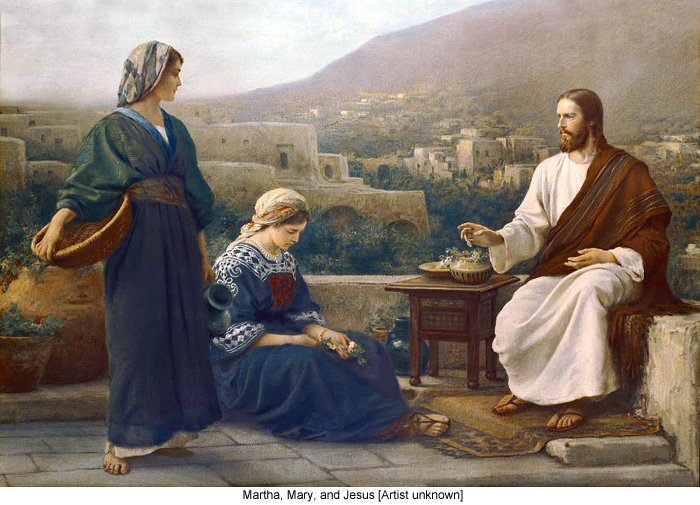 And she had a sister called Mary, which also sat at Jesus’ feet and heard His Word. But Martha was cumbered about much serving, and came to Him and said: ‘Lord, dost Thou not care that my sister hath left me to serve alone? Bid her therefore that she help me.’ And Jesus answered and said unto her: ‘Martha, Martha, thou art careful and troubled about many things; but one thing is needful; and Mary hath chosen that good part, which shall not be taken away from her’” (Luke 10:38-42). The one thing needful is that Jesus’ Word be preached and taught and heard. Nothing at all on earth is as important and necessary as this. For it is through the preaching and teaching of the Word that men are “[made] wise unto salvation through faith which is in Christ Jesus” (II Timothy 3:15), and it is by the hearing of the Word of God that saving faith is wrought and sustained within us (Romans 10:17; I Peter 1:5). It is that saving faith, God-wrought confidence of the heart in His mercy in Christ Jesus, wherein we poor sinners stand before God righteous in His sight, justified or made right with Him by Christ’s vicarious satisfaction of His justice, and saved eternally as His unconditional gift of grace. Without such faith, which is created and sustained only and exclusively through the Word of the Gospel, no one can be saved. Our own works of merit do not avail to earn God’s favor or contribute in any way to our forgiveness and salvation; and even the best of our works, apart from faith, can by no means please God even as thank-offerings for His mercy. That is why the preaching and teaching of the Word of God is “the one thing needful” “to give [us] the light of the knowledge of the glory of God in the face of Jesus Christ” (II Corinthians 4:6), and why the hearing of that precious “Word of reconciliation” (II Corinthians 5:19b) is the indispensable means whereby God earnestly desires to bring “all men…unto the knowledge of the truth” (I Timothy 2:4; Romans 10:17). Therefore let nothing distract your attention and your heart’s desire from opportunities to hear and learn the Word of God, the Word which, engrafted in you by the work of the Holy Spirit, is able to save your soul (James 1:21). Enabled by its saving power, let no one take it from you! PRAYER. – I thank Thee, merciful Father, that Thou hast graciously given us Thy holy Word as a lamp unto our feet and a light unto our path. Preserve it to me and to all believers until the end of days! Let it also have free course through the world, that all men may see Thy salvation and be brought to saving faith by means of its power. Grant to me and all believers Thy Holy Spirit, that we may always value it as the one thing truly needful, and gladly, diligently, and devoutly hear and learn and follow it. Awaken hearts everywhere to hear and heed it, that thereby many may be converted and saved eternally through faith in Christ Jesus, the only Savior of sinful men. Amen. as intent each word she noted, at her Savior’s feet reclined! Thus my longings, heavenward tending, Jesus, rest alone on Thee. Help me, thus on Thee depending, Savior, come and dwell in me!